There are as many different hair brushes as there are hair types; is there really a wrong choice? The right brush for your hair will help maintain a great style and keep your hair looking healthy without the use of heated tools. Take a look at some of the options, and see which brush suits your hair best! 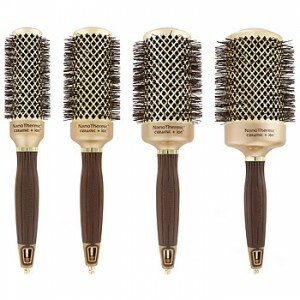 These thermal brushes come in all different size barells to achieve the best style for your hair. Sizes vary from 1/2″ barells all the way to extra-large 4″ barells. The brush can increase volume and form a style to last all day. Use Pureology Nourishing Nectar for added hold, and a blow dryer with a concentrator. Curl small sections of hair around the ionic round brush, use the cool button on your dryer when finishing each section to gain added hold. Hold the style using Redken 18 Quick Dry setting spray. Sam Villa Paddle Flat Brush– For a smooth, sleek finish this brush will cover a lot of ground (hair) with each stroke. 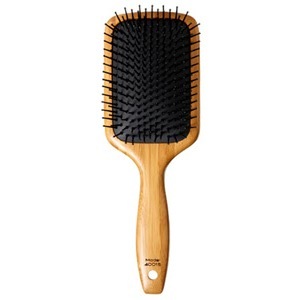 If you have curly or unmanageable hair this brush will give you the upper hand. Using a blow dryer and smoothing cream such as Redken Align 12, brush through each section using the concentrator on your dryer from root to end. Using this style brush will create beautiful shiny hair in no time!